Check out my Introduction to Baby Storytime if you haven't already. Busy Piggies (A Busy Book) is a great book about the different things pigs do. Rhyming text and photographic illustrations. Substitute baby’s name for “baby”. Last March, I posted that I was looking for something to do, programming wise, about the Japanese Earthquake and Tsunami. What we ended up doing is folding 1000 origami cranes. 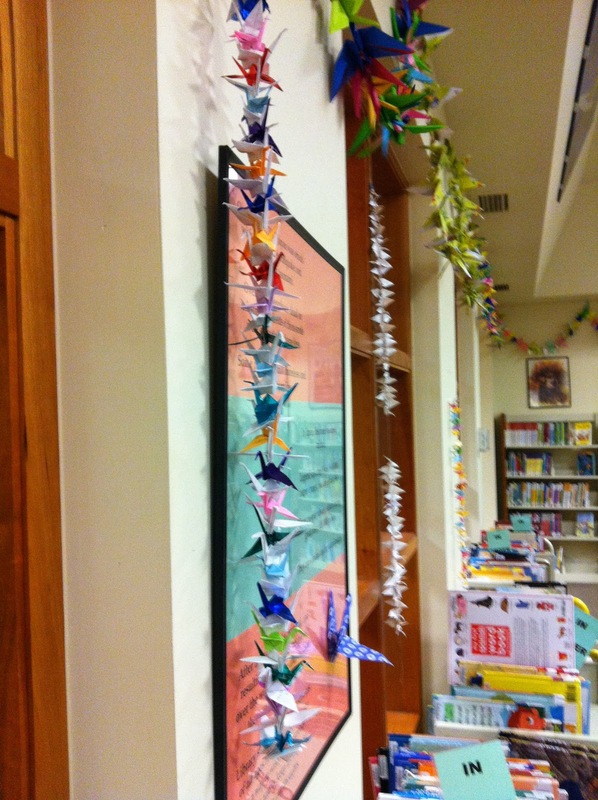 In Japan, cranes are a sacred animal and tradition says that if you fold 1000, you can ask a crane for a wish. Our wish was for a speedy recovery for Japan. This was a passive program that just finished up last week. 3. We have a lot of after school care groups that come in. The first few days, I pulled the oldest kids aside and taught them how to make cranes. Once they mastered it, they taught everyone else. 4. When people saw the flyer (we also had a few cranes scattered around the desk) we gave them paper and instructions. If we had time, we would show interested people how to fold them. 6. I kept count and sewed them together to hang up like garland around the room. This project was great! 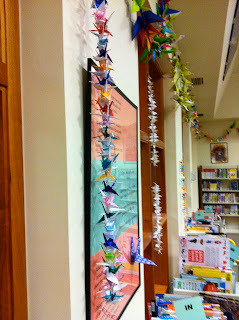 Staff found folding cranes to be very therapeutic when things got crazy. The kids had something to do while waiting for computers and we managed to keep Japan and the earthquake and tsunami in our thoughts long after the news cycle had moved on to other things. It also gave them a long-range goal to work towards. AND! It was free. The vast majority of our cranes were folded from old program flyers. The really small white ones are from hold slips and computer guest passes. We did have some origami paper left over from something else and our Friends group bought some more for us, but it's not needed for the program. Overall, it was a lot of fun and successful. I'd do it again. Check out my introduction to Preschool Storytime if you're new. This week's theme was Owls! Mainly because I wanted an excuse to read Little Hoot. The dynamic was a little.. off as we had a small group of rather hyper kids. It probably would have gone better if I just did jumping jacks for the full 30 minutes. For other books on display, I had Little Pea by Rosenthal, Allen's other Little Owl Books (I'm Not Sleepy and I'm Not Scared) as well as all of the nonfiction we had on the shelves about owls. New to Baby Storytime? Read this! Today was a fun story time-- some new rhymes that got added to the spreadsheet while I was gone and recently discovered by me! Plus, lots of me messing up (often happens with new rhymes). But even more so-- I messed up some of the rhymes (totally normal) plus I got so excited about doing the new Charlie Chaplin rhyme that I totally forgot to read my first book! Usually, the first book is read after "Hickory Dickory Dock" and then right before "Patty Cake" we sing the Raffi song and read the second book. Today, right before "This is the Way the Ladies Ride" we read a book, shook our sillies, read another book. Except I started reading on page 2. STORYTIME WIN! Ah well, you just laugh, apologize, and start over and no one really minds. Spot Says Goodnight has flaps to lift! Babies love lifting flaps. It's playing peek-a-boo with a book! Basher: Go! Go! Bobo Colors is another fun concept book from Basher. Swing him around and tickle him all over. Need to know what's going on? Read this. Happy Hippo, Angry Duck: A Book of Moods is Sandra Boynton's latest, and in my world, Boynton is storytime gold. Busy Elephants is part of the "Busy Book" series. I like the photographic illustrations and cute animals. I mean, this book has BABY ELEPHANTS. At the tickling of… your KNEE!